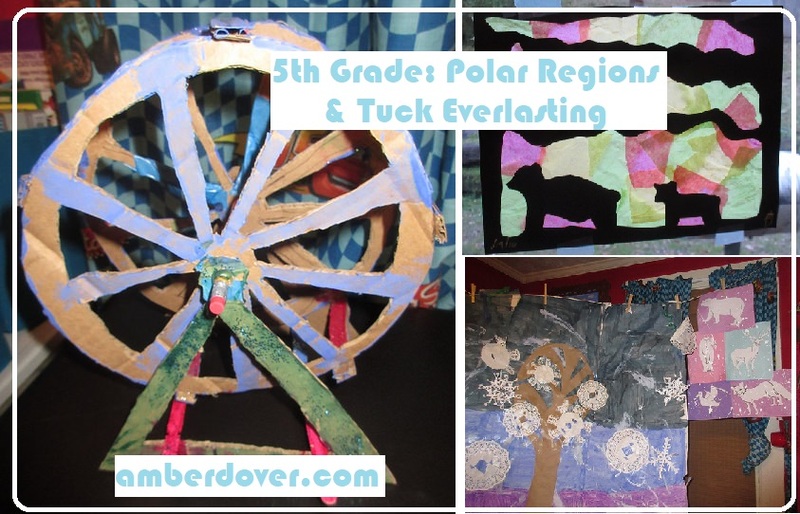 In this post: Arctic Fun, a Tuck Everlasting Ferris wheel, and Van Gogh’s cat. Join us for a trip back to our 5th-grade studies! Hello, Dear Ones! This is my 5th post for our 5th-grade studies from a couple of years ago. In geography, we learned about polar regions and in science, we learned about light. Our famous artist was Van Gogh and we made a nice craft for the book Tuck Everlasting. We did these studies in January of 2016. Here’s how we learned! Winter Tree Art with snowflakes and Arctic Play Area with Igloo- Sometimes I look on foreign Pinterest pages for unique ideas. I combined two ideas (one is in Russian) for the snowflake tree from here and here. The igloo is made with a down comforter and a DIY fort kit. I love the snowflakes we made from paper doilies. Stained Glass Polar Bears- Tissue paper and polar bear silhouettes on construction paper. A Winter PJ party at our homeschool group- Awwl, Michael was so cute in his PJs…no way he’d wear them in public now…my tall preteen. Hannah read the kiddos a winter story and we learned about snowflakes. Leeland played on his blanket. Tuck Everlasting is such a lovely story. I fell in love with the movie when I was a teenager. I think it’s a great alternative to Twilight. The lead girl actually makes a wise decision about immortality. If you haven’t seen Tuck Everlasting, I highly recommend it. Michael read the book first. The movie is family friendly, though a few scenes may be scary for small children. Music- My heart melts as I reminisce over my guys playing music together. Leeland was so small! So far Leeland is my singer. He makes up songs on the spot so much that I feel like I”m living in a musical! Ha! I was sad at first when the homeschool room changed into Leeland’s room. Michael and I had so many memories in it. But now Leeland is at home there and I can’t imagine him not being in that room. Plus, it’s nice to get sleep every now and then. That was really hard when Leeland slept with us. I’m still planning on doing a big post on our schoolhouse. I’m way behind but the plan is there ;). It was the year the river flooded! We also tore down Terabithia so we could make room for the schoolhouse. Though part of Terabithia stayed in the back yard until recently.